57% of multi-site churches will launch an additional campus in the next 12 months and spend, collectively, more than half a billion dollars on technology. Churches are moving to end-to-end 4K/60p production-value solutions. Digital scenery is desired through laser projection for I-MAG screens as well as edge-blending projectors. 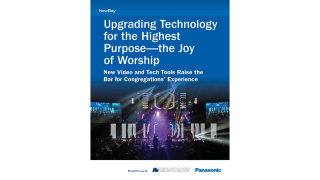 Transformation of worship experiences via new technology tools to target millenials.